Concentrating solar power (CSP) is used to generate solar electricity. However, as a homeowner, this isn't a solar electricity solution that you would implement for your own home. Concentrated solar power is actually a utility-scale solar solution that can provide hundreds of megawatts of electricity to the grid. But CSP is still an important solar technology for homeowners to be aware of because it has the potential to provide significant amounts of clean, renewable energy that could be provided to you by your utility. 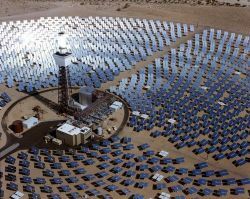 Of all the current solar technologies, concentrated solar power has the most promise of providing a large-scale, sustainable alternative to fossil-fuel power plants. The first thing to understand about concentrated solar power is that the primary form of energy it generates is solar thermal energy, also known as heat. This is very important because heat is able to be efficiently stored at significantly less cost than electricity. For solar technologies, energy storage is critical since the Sun isn't always available for energy production. 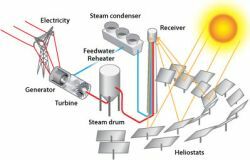 Most often, oil or molten salt is used to store the heat generated by the concentrated solar energy. This is very cost effective compared to using batteries for storing solar electricity. The second thing to understand about concentrated solar power is that the heat it generates is used to drive a turbine or engine. The turbine or engine then powers a generator which produces electricity. This electricity is then delivered to the grid. Which powers a generator that provides electricity. And of course, efficient energy storage is critical to allow for electricity generation after the Sun sets or on cloudy days. Now that you've seen the basic idea behind concentrating solar power, let's take a look at the different types of CSP systems in use today. Power Tower Systems use a large field of Sun-tracking mirrors known as heliostats to focus sunlight onto a central receiver at the top of a tower. The receiver contains a heat-transfer fluid which is heated by the concentrated sunlight. The heat-transfer fluid is used to create steam which drives a conventional turbine generator to produce electricity. Dish/Engine Systems use a parabolic dish to focus sunlight onto a receiver located at the focal point of the dish. The dish tracks the Sun in order to take full advantage of the available solar energy. The receiver contains a fluid or gas which is heated by he concentrated sunlight. The heated fluid is used to drive a Stirling engine to produce electricity. Parabolic Trough Systems use parabola-shaped reflectors to focus sunlight onto a tube that runs along the focal-line of the reflectors. A heat-transfer fluid inside the tube is heated and used to generate steam to drive a conventional turbine generator which then produces electricity. Concentrating solar power is a simple and proven solar technology. Using CSP, enough electricity to power the entire United States could be generated in less than 100 square miles of land in the southwest.